Hilton Pond Field Trips: Cosmic Coincidence? Let's suppose you taught third through fifth graders and the school science curriculum called for you to cover wide-ranging topics such as: Adaptations, biotic and abiotic factors in the environment, symbiosis (commensalism, predation, parasitism), factors that limit populations, food chains and food webs (including producers, consumers, scavengers, and decomposers), how habitat change affects plants and animals (and how organisms change their environment), classification of animals, and inherited traits versus learned behaviors, AND all the while encouraging development of such cognitive attributes as inference, prediction, and how to make accurate scientific observations using all your human senses. In many schools across the country, a teacher responsible for covering these concepts and skills does so with lectures, filmstrips or videotapes, homework assignments, and perhaps a classroom laboratory exercise or two. Not Sherilynn Watts, however. Faced with the seemingly impossible task of teaching all this and more to her gifted and talented students at The Children's School in Rock Hill SC, she did what her naturalist father would have expected her to do: She decided to take her classes to an outdoor locale where her kids could experience--not just hear about--all the things she wanted them to know. And where might she go for a total-immersion Guided Field Trip that could cover all the required topics and skills, and more? Why, Hilton Pond Center, of course! 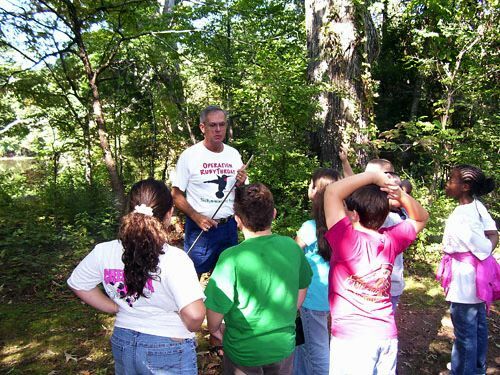 Hilton Pond Center has been open for field trips since its inception in 1982. 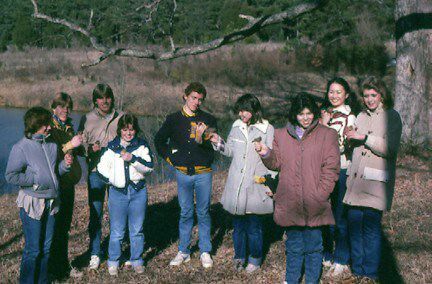 During a teaching stint in the 80s at Rock Hill's Northwestern High School, we frequently brought our biology classes to the Center--just ten miles away in York--for outdoor learning activities. As might be expected, one of the highlights of such trips was the opportunity to band birds (1984 class, above) and use them as a tool to talk about some of the very topics Sherilynn Watts covers with her science students of today. But we also looked at other aspects of natural history, including water quality, animal diversity, and natural succession. Hilton Pond Center is an especially good place to talk about the latter because it's a perfect example of how nature--given a chance--can reclaim land from almost any calamity, natural or otherwise. 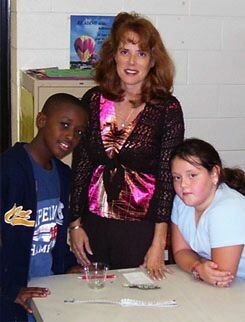 Sherilynn Watts scheduled two visits to Hilton Pond this week, the third graders coming on 2 October and the fourth and fifth graders the following day. We began each Guided Field Trip with a general introduction to the property, which definitely involved thinking about the natural succession concept. On Day One, for example, we asked the third grade students (above)--most of whom were about eight years old--to make a reasonable estimate about the age of the trees and shrubs that surrounded them. Guesses ranged from 35 to 250 years, all of which were too high. Granted, there are a few trees around Hilton Pond that have existed at least a century, but the vast majority are about 25 years old--which happens to coincide with the age of the Center. We explained that when we purchased the Hilton Pond property in 1982, it had been in row crops or grazed by livestock for perhaps a hundred years, and except for those few older trees the entire site was vegetated almost exclusively by grass. Determined NOT to waste the time and energy required to cut 11 acres of lawn, we decided early on to lay out a meandering network of walking trails and let the rest of the property go. The result is that in just a quarter-century nearly every square inch of land has been replaced by a 25-year-old mixed woods--a very fine example of natural succession at work. Sherilynn's students were amazed--as is nearly every visitor to Hilton Pond--at how well nature, given a chance, can heal herself in such a relatively short period of time--depending only on wind, birds, and small mammals to disseminate seeds. As proof of this phenomenon, compare the top photo on this page (taken in 1984) with the one just above snapped by Sherilynn from almost the same spot in 2006. The photo of fourth and fifth graders just above also shows the field trip leader brandishing not a walking stick, but a yardstick. 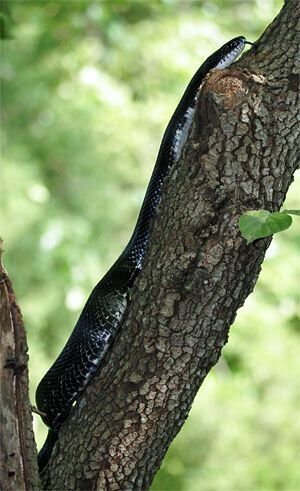 That's because on Day Two--just before the students arrived--one of our resident Black Ratsnakes (above left) was descending from its daily exploration of the Flowering Dogwood tree just outside our office window in the old farmhouse at Hilton Pond. The students were barely off the bus when we hurried them into the backyard for a look at this sinuous reptile as it nonchalantly slithered from the base of the dogwood toward the pond. We're pleased to report the students weren't the slightest bit alarmed by the snake, and they made some excellent observations about the serpent and its color: Glossy black, with a white chin, and a hint of rectangular markings on its back. When we asked how long the snake was, student guesses ran from "pretty big" to "three feet" to a precocious and scholarly "1.5 meters." Further prompting led the kids to conclude we really should be scientific and measure the snake--hence the yardstick. We had marked on the ground where the snake's nose and tail had been when it was fully elongated, and the measurement came to about five feet--or 1.5 meters--a very accurate guess by one student and a pretty good size for a backyard Black Ratsnake. For obvious reasons, we always try to include bird banding in any Guided Field Trip at Hilton Pond. 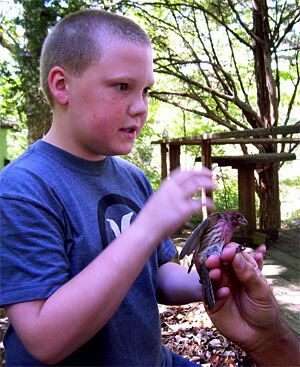 For school groups, it's highly unlikely bird banding is actually a curriculum topic, but we do use birds-in-the-hand to teach many of those curriculum-based concepts Sherilynn Watts was looking for. Her classes were fortunate because trapping was successful on both days; sometimes birds don't go into traps or nets just because an eager student wants to see how we handle and band them. With third graders on Day One (above right) we trapped a brown House Finch they examined pretty closely; serendipitously, because we also captured a red House Finch, the students also were able to conclude that by this time of year the brown one was a female and the red one a male. This led to a discussion of the adaptive significance of different colors for the two sexes; the youngsters correctly concluded the female needed to be more camouflaged when sitting motionless on the nest, while males needed to be more colorful to attract the females' attention. With fourth and fifth graders on Day Two we got into a bit more detail about how to make observations of birds: Always be sure to note their SSC--size, shape, and color. Then we showed them how to use a birding field guide, narrowing down identification choices by comparing one illustration with the next. The kids decided the red bird (above left) was sparrow-like because of the conical shape of its bill, which eventually led us to the field guide pages depicting House Finch, Cassin's Finch, and Purple Finch. The students astutely ruled out Cassin's by looking at range maps and determining it was strictly a western species, and then scratched off Purple Finch because they come south only in winter. By process of elimination--a very useful scientific technique-- the students concluded correctly that we had captured yet another male House Finch--our 7,369th HOFI banded at Hilton Pond since 1982. One thing that made this week's field trips so productive was that Sherilynn Watts had prepared her students for their visit. She had already acquainted her classes with many concepts we were able to reinforce by pointing out the "real thing." 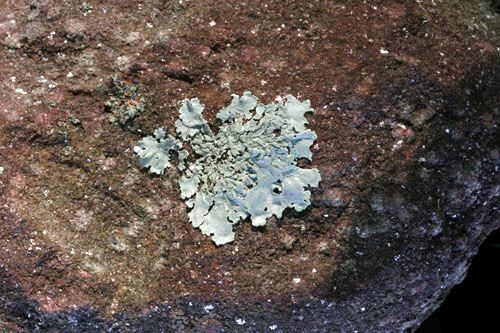 For example, when one student asked about foliose lichens growing on rocks lining the Center's driveway (above right), they remembered the gray-green growth was an example of symbiosis between two different organisms. This preparation allowed us to talk in greater detail in the field about the mutually beneficial roles of the photosynthetic alga and water- and mineral-collecting fungus. After the two field trips had ended and her students had returned to school, Sherilynn Watts on days following did something else very important by reinforcing the Hilton Pond experience in a variety of ways. For one, she took back a small sample of lichen and had the students experiment with it (left) to see if the dry mass would expand when water was added, measuring "before and "after" diameters--all in metric, of course. Ian--The favorite thing I liked was how to birdband because I thought it was cool watching him band the bird. Tristan--Hilton Pond was fun, but I liked watching him band birds. I liked it because I had never seen a person band a bird before. Madison--My favorite part was bird banding because I had never actually seen someone band a bird before. I didn't know that the birds fly back to the same yard every year after winter. It's neat that if you find a dead bird you can call in the toll-free number and the people at the bird banding office will tell you who banded the bird. Josh--I liked the Sugar Maple tree because some people don't know what syrup is really made of. Morgan--My favorite part was learning how eventually Hilton Pond will turn back into dry land. It was my favorite part because I had never heard that a pond could do that. 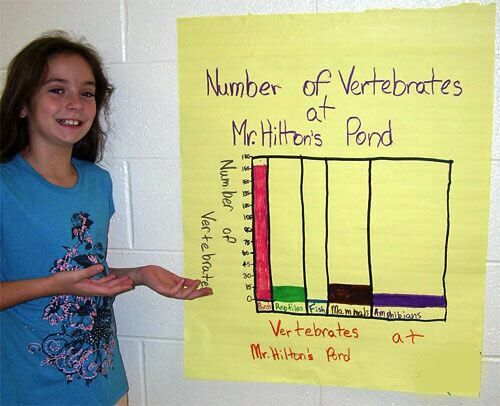 Another of Sherilynn's post-field trip activities involved having the fourth and fifth graders quantify some data. For this they turned to the section of the Hilton Pond Web site that deals with our on-going inventories of plants and animals. One student (below) chose to graphically represent that we have observed far more species of birds at Hilton Pond than all the other classes of vertebrates out together. 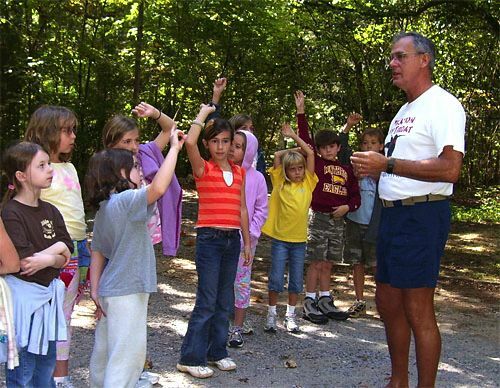 Leading Guided Field Trips at Hilton Pond Center is always rewarding, especially because each visit enables us to act out our lifelong role of educator-naturalist. These excursions also allow us to demonstrate real-time--without impersonal videotapes and filmstrips--how individual landowners can allow natural succession to occur on private property, to the benefit of plants, animals, and humans alike. Thus, we're grateful for teachers like Sherilynn Watts who care enough about education AND the environment to take their students into the real world of nature, and to institutions like The Children's School for supporting such activities. 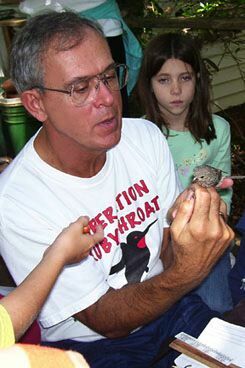 Sherilynn's father, Jerry Nagel, is a career wildlife biologist known for efforts to re-introduce Brook Trout into East Tennessee and Western North Carolina, so she had an early interest in natural history studies; to her credit, she has retained that interest and her desire to convey it to her classes. Far too many teachers fail to take field trips because they require a little extra effort to plan, far too many parents fail to demand their children benefit from the enrichment provided by field trips, far too many school districts fail to support field trips with the instructional budget, and far too many school principals fail to understand that well-desgned field trip time outside the classroom actually can and does enhance learning, cover the curriculum, AND--in the process--improve almighty test scores. Sherilynn Watts' students were a great audience this week for our environmental teachings, but for us the most rewarding aspect of the two field trips came when no less than FIVE of her 22 students revealed we also had taught one of their parents at Northwestern High. In fact, if you scroll back up this page you'll find one of the students in the top photo from 1984 is the mother of one of the girls in the class just above from 2006. Unless you're an educator, it might be hard for you to understand the wonderment and excitement and deep satisfaction we felt over this "cosmic coincidence," knowing we had taught environmental concepts to mother and daughter--22 years apart--on Guided Field Trips at Hilton Pond. 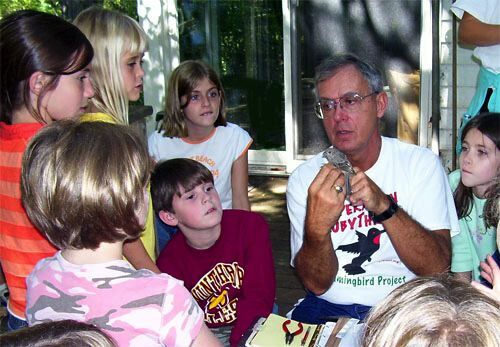 POSTSCRIPT #1: Hilton Pond Center for Piedmont Natural History is available for Guided Field Trips for individuals and student or adult groups from schools, colleges, conservation organizations, garden clubs, and other organizations. The Center is open by appointment only. For information about scheduling a visit, please see On-site Guided Field Trips. POSTSCRIPT #2: The Children's School at Sylvia Circle is part of Rock Hill (SC) School District 3. The school uses Montessori curriculum and philosophy in teaching about 360 students in pre-K through fifth grade. --Two Ruby-throated Hummingbirds captured this week on 2 & 4 Oct are likely to be the last of the 2006 season at Hilton Pond Center. Since 1984, we've banded only 39 RTHUs in Oct--about 1.14% of the 3,410 total for that period. 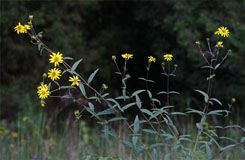 --Our sole Schweinitz's Sunflower, Helianthus schweinitzii--a federally endangered species--first bloomed in 2004 but did not even produce stalks and leaves last year, leading us to believe the plant had died. Thus, we were surprised in 2006 to find TWO vegetative stalks arising from the sunflower's rootstock. This fall, both stalks produced a total of about 30 composite flowers (above), all of which we hope will set seed.